All SpringCard PC/SC Readers feature a set of Configuration Registers that allow to alter the Reader behaviour to match a particular hardware setup or end-user requirement. Editing the configuration is easy thanks to MultiConf, the new versatile configuration tool that covers all SpringCard products. But MultiConf is a GUI-application. When it comes to configuring numerous readers at once (with the same settings of course), a command-line tool, suitable to operate in batch mode, could be preferred. This is typically the aim of pcscconf, a simple command-line utility (targetting Windows systems). 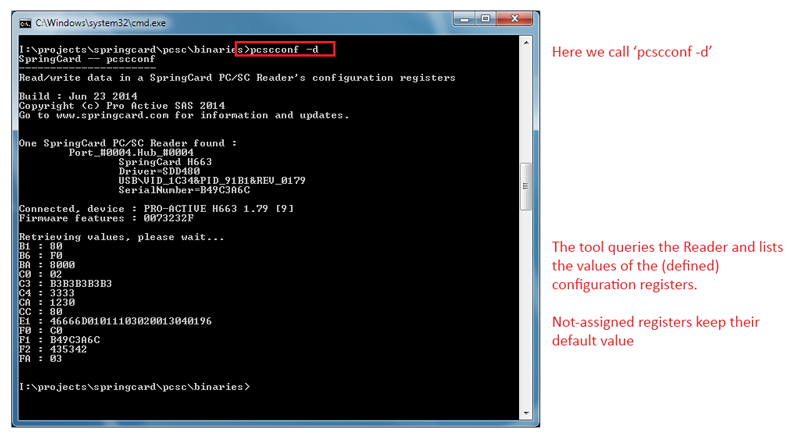 pcsctool.dll, the library that makes both software work. to dump the current configuration. to dump the configuration to a file. pcscconf uses the same file format as MultiConf. to upload the configuration from the file into the reader. There’s no confirmation prompt or ‘Are you sure’ dialog box. Be sure to double-check the content of your file before uploading it into the reader. Changing a reader’s configuration will change its behaviour! You’re using this software at one risk. Always refer to the reader’s detailed Developer’s Guide or use MultiConf to choose the appropriate values. Some registers play a special role and are therefore protected before delivery. This is the case of registers C0 and F0 to FF. Trying to write in one of these registers will always fail. pcscconf targets the SpringCard PC/SC Readers only (and not the RFID Scanners, /RDR family and access control readers, nor the Legacy products). pcscconf is able to work with only one PC/SC Reader at once. If you run pcscconf with two readers or more connected to your computer, the software will issue a warning and exit.